Harry Winston (NYSE:HWD) is buying BHP Billiton's diamond assets, including its controlling interest in the Ekati Diamond Mine as well as the associated diamond sorting and sales facilities in Yellowknife, Northwest Territories and Antwerp, Belgium, for US$ 500 million. Harry Winston shares were off 2.23% to $13.15. BHP Billiton (NYSE:BHP) was relatively unchanged, off 0.6% to $70.92. The Ekati Diamond Mine consists of the Core Zone, which includes the current operating mine and other permitted kimberlite pipes, as well as the Buffer Zone, an adjacent area hosting kimberlite pipes having both development and exploration potential. The agreed purchase price, payable in cash, is US$400 million for the Core Zone interest and US$100 million for the Buffer Zone interest, subject to adjustments in accordance with the terms of the share purchase agreements. The Ekati Diamond Mine, which is located approximately 310 kilometers northeast of Yellowknife in theNorthwest Territories of Canada, includes both open pit and underground operations and is Canada's first, and largest, diamond producer, having begun production in 1998. It is located near the Diavik Diamond Minein which the Company holds a 40% interest. 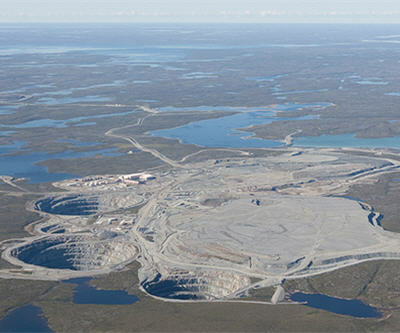 Image of Ekati Diamond Mine, note 3 open pits in foreground. Photo by Jason Pineau.